ACCN has created Canada’s first Black youth robotics team and with the support of FIRST® Robotics Canada (FRC) and will be competing in the 2018 international FRC competition. We have launched a gofundme to cover expenses such as parts; competitions; uniforms; transportation and refreshments. We invite you to support this incredible journey. Your generosity will enable these hard-working boys and girls to compete with pride, while benefitting from a life changing experience. At 10 a.m. January 6 NASA announced the 2018 Build Challenge, giving teams around the world six intensive weeks to build their robot. 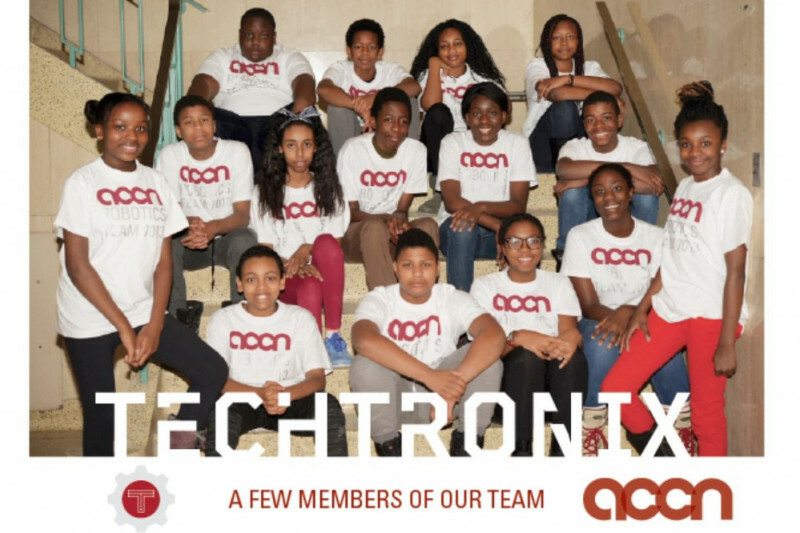 The ACCN TECHTRONIX team is made up of 25 youth from different Toronto neighborhoods. Ryerson has generously donated a place for us to build our robot. We also have a dynamic team of Ryerson professors, engineering and design students who are donating their time and talent to teach and mentor the youth. ACCN created TECHTRONIX to nurture Black youth success in STEM (Science, Technology, Engineering and Math) careers, and is an outgrowth of its highly successful placement of over 100 talented Black youth in top independent schools over the past 10 years. The FIRST® Robotics initiative supports a broader population of youth to take their place at the STEM table. Together we can make a difference in the lives of these young people! Donations over $50 will receive a donations receipt upon written request. Please send requests to info@accntoronto.com with the subject line: "DONATIONS RECEIPT"
We thank you for your kind consideration in support of this amazing venture as we write history. ACCN Techtronix would like to express our sincere gratitude for your kind donation given to support the first black team of boys and girls from the community to enter the international First Robotics Competition. We’d like to share with you the ACCN Techtronix’ story. ACCN was founded to encourage and support black youth in living lives free of violence. We believe that all youth are born with potential. Our job is to match the right resources with their hard work to maximize this potential. Studies show that black youth do not get the opportunity to be at the STEM (Science Technology Engineering and Math) table and as such they do not readily have the chance at the learning opportunities and careers associated with the wealth building jobs of the future. Entering the First Robotics Competition was ACCN’s way of telling these black boys and girls that they belong at the STEM table. •	In December 2017, we recruited 25 boys and girls from across all quadrants of the Greater Toronto Area. They quickly learned and mastered the skill of collaboration as they worked with other students whom they met for the first time. With the help of the mentors, all engineering students from Ryerson University, we began teaching the students to code using Java Script and modelling using Solid Works, a CAD software. •	In January 2018, NASA announced the build and we were off. Collaboratively, the students designed the robot to win and to maximize points acquisition. The build period continued for 6 weeks as the students learned other new skills that they will use throughout their lifetimes. The experience for the team was nothing short of transformative. We had students who never thought of going to university and who are now looking forward to doing so. ACCN is committed to helping by pointing them to the right academic supports. Many are now turning their attention to studies in the field of engineering. Again, thank you for investing in the lives of these young people. Neither you nor I can fathom the total impact of your kind consideration. A picture speaks a thousand words, so please peruse the attached videos so you can see their journey. Click here to see our journey to date. Our attention is now turned to “Girls In STEM”, Coding through Microsoft and otherwise, First Lego League for the younger ones, and much more. We trust that you will continue to be part of our journey. Stay tuned! We thank all of our donors and encourage everyone to follow us @accntechtronix on instagram and twitter. Please like, share and re-post! We still need support ! Phase II Motorcar Company Inc Phase II Motorcar Compant Inc.